Lately my daughter and I have been following the same afternoon routine…Little bro goes down for a nap and the girls head to the kitchen! 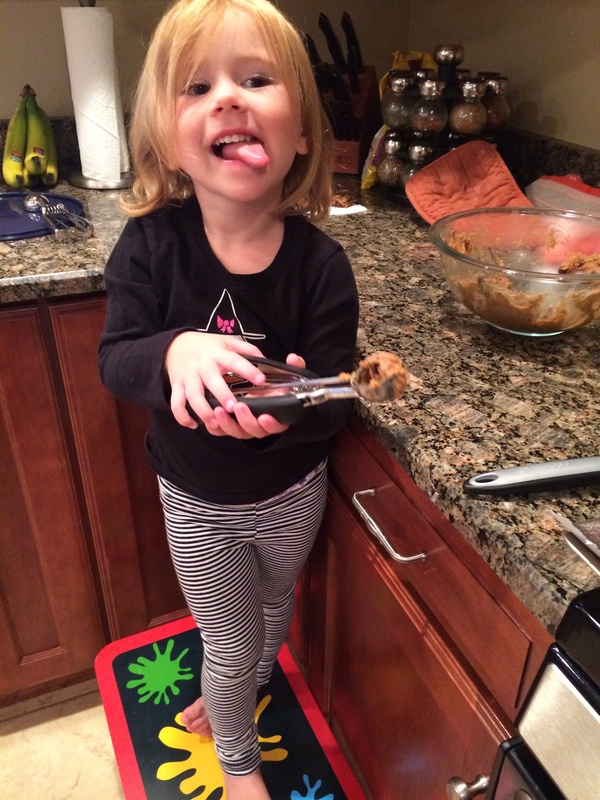 Its usually some Almond Butter Rice Krispy treats (as in approximately every other day because I can’t seem to keep my hands out of the pan), but she had a new request for an old favorite – Chocolate Chip cookies! I have the best recipe from Hubby’s grandmother but its been so long since I baked that when I went to pull out the ingredients I realized I only had whole wheat flour. Now, I’m sure they still would have been good…but they would not have been “MeMaw’s cookies” so I had to come up with a new plan. 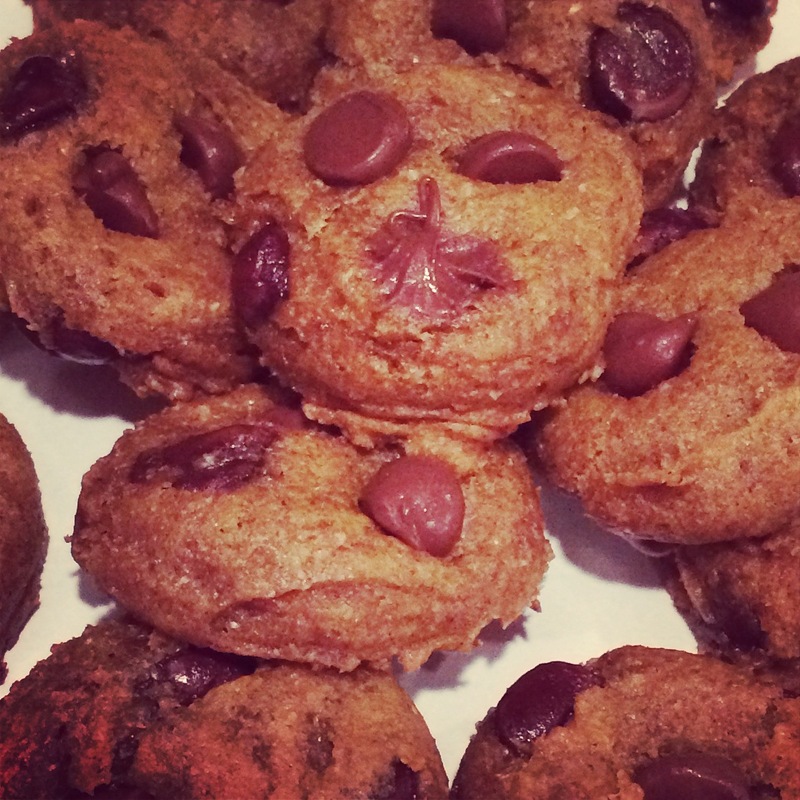 I found a can of pumpkin leftover from last fall-but-it hadn’t expired…enter – Pumpkin Chocolate Chip cookies! I didn’t have a recipe of my own so I went to google and found this one from Sally’s Banking Addiction. Again, since I was so unprepared I made a few alterations but followed her main directions and swapped out some things here and there to make them my own. All in all they turned out great, my daughter enjoyed them, and my husband was even happier to come home to cookies after work! 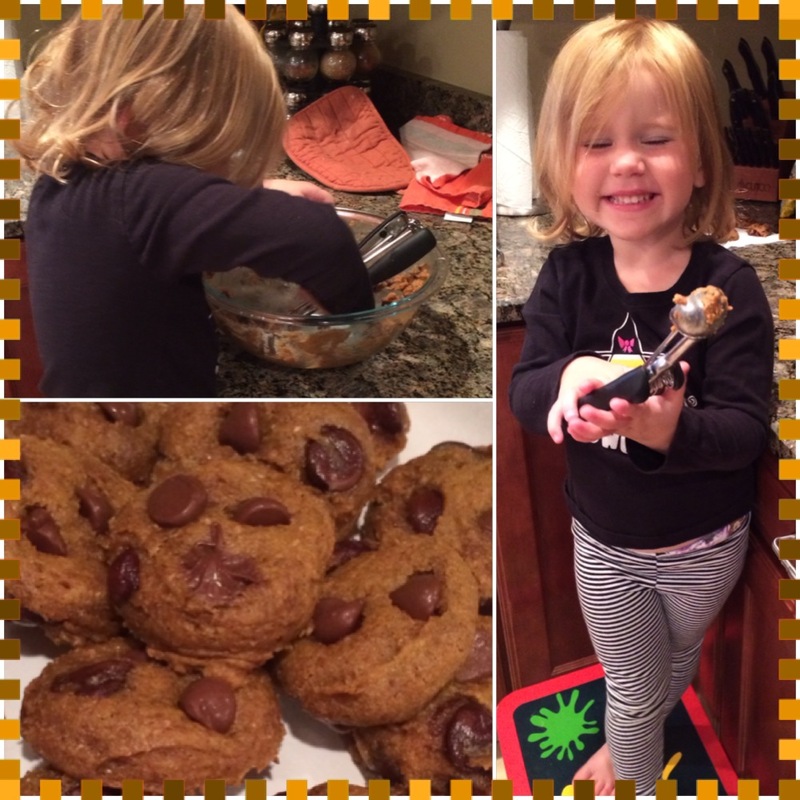 From a girl who used to bake weekly…homemade sweets are rare these days and most certainly treasured when around! In a large bowl, toss together the flour, salt, baking powder, baking soda, cinnamon and pumpkin pie spice. Pour the wet ingredients into the dry ingredients and mix together with a large spoon or rubber spatula. The dough will be very soft. Fold in 1 cup milk chocolate chips. They may not stick to the dough because of the melted butter, but do your best to have them evenly dispersed among the dough. Cover the dough and chill for at least 30 minutes, or up to 3 days. Chilling is mandatory. Using a cookie scooper (I like the pampered chef small cookie scoop) scoop the dough balls (or roll the dough into balls, about 1 Tablespoons of dough each). Bake the cookies for about 9 minutes. The cookies will look very soft and underbaked. Keeping them in the oven for longer may dry them out. Remove from the oven and press a few more chocolate chips onto the tops, if desired. 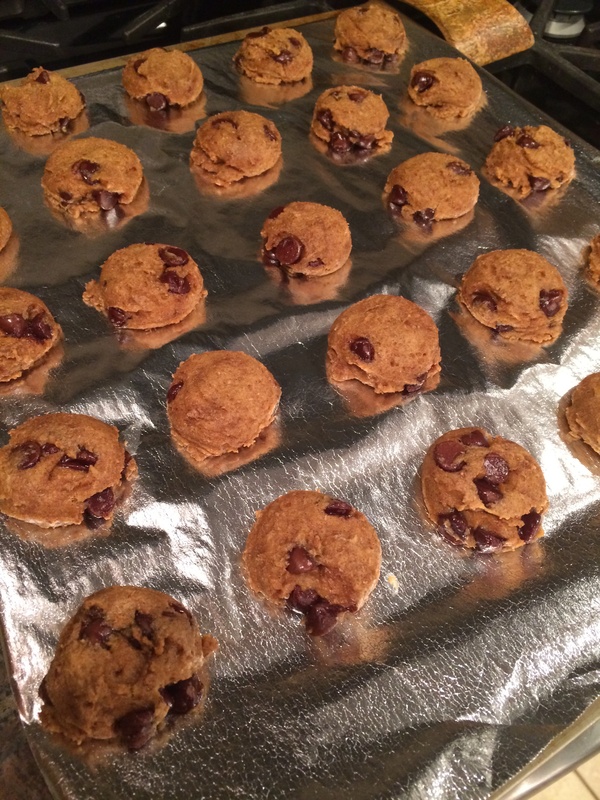 If you find that your cookies didn’t spread much at all, flatten them out when you take them out of the oven.